This is kind of an older review since I've had this printer for about a year and it still works great. I'm not sure if this exact model is still being sold but I see similar models all the time for around the same price range. These run for around $40 - $70 all the time after rebates. Currently Best Buy and Fry's has it for this price. - toner saver mode. Blacks are just slightly less black. It's suppose to save up to 40% in toner. I leave it on toner saver mode all the time. - fast. warm up from sleep < 15sec. It's suppose to be around 17ppm (closer to 15 in real life). Still plenty fast for me especially coming off of ink jet. - print drivers are pretty rich. Lots of options to print multiple pages on one sheet of paper. It also has odd/even pages so you can do manual duplexing. - a reall full size paper tray that holds 250 pages. - tiny and light printer. foot print around 15X15 inches. - there is a manual single sheet feeder on the front, and you can pop the back down so the paper ejects out the back. This gives you a straight paper path so you can print on a larger variety of items. - some issues with manual duplexing. I was printing a large document with a LOT of black coverage (we are talking black background, white text). It seemed like when I put the paper back in the tray to print on the other side, while printing some static charge built up and some of the pages were sticking together which basically messes up duplexing. I tried it again the next day with a 150 page manual doing manual duplexing and didn't have a single issue. This manual was a more typical document with mostly text and a few diagrams. Either way I never had an issue when just printing like normal. It was only with these very black saturated pages that I was feeding in a second time that caused some issues. - I just refilled the toner (I've been printing a lot of guild wars maps with probably around 80%+ coverage). 5 quick screws and the cartridge opens up easily. Just pour the toner in, close it up, clean it up a bit, and you are good to go. I printed the exact same thing with original toner and then with the refilled toner. I can't tell any difference in quality. 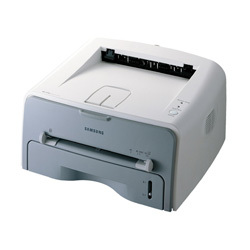 Samsung laser printer are new in Bangladesh market. Price starts from USD $110 . For more details price list you can see from..